This classic Victorian is located in Dolores Heights on one of the neighborhood’s most desirable streets -historic Liberty Street. The home is complete with a double parlor, formal dining room with built-in cabinetry, an eat-in kitchen, three bedrooms, and one bathroom. Pocket doors, wainscoting and beautiful rosettes play wonderfully alongside modern lighting and kitchen updates. There are lovely softwood floors throughout the property. The living room is warmed by a Craftsman era wood-burning fireplace. The expansive back garden has terraced brick patios and wandering paths through redwoods, California lilacs, rhododendrons, honeysuckles and a vegetable garden. 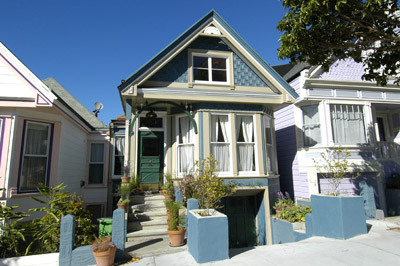 The home has a very large attached garage and is an easy walk to the shops and cafes of the Castro and 24th Street.